Linebacker Kolin Demens once committed to UCLA and is now heading to Orono to play for the Black Bears. Linebacker Kolin Demens was recruited out of Detroit two years ago by some of the top Power Five programs in the NCAA – UCLA, Michigan, Michigan State, Wisconsin, Pittsburgh and Kentucky among them – and actually verbally committed to one of them. Instead, after attending Avon Old Farms, a prep school in Connecticut, this year, he’s ending up in Orono to play for the University of Maine. And the Black Bears – coming off a 10-4 season that saw them compete in the Football Championship Subdivision semifinals for the first time – know they’re getting someone special. According to HERO Sports, a website that covers all college sports at every level, the 6-foot-2, 210-pound Demens was the No. 2 recruit in all of FCS football. And Maine came out on top. “We just built a really good relationship once we started talking,” he said. 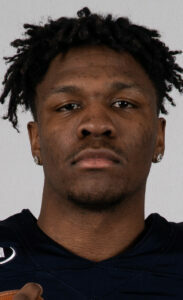 Demens, 18, was greatly impressed by the coaching staff – “They have a young coaching staff, so they relate to a young dude like me,” he said – and he enjoyed the campus on his official visit at the beginning of February. And he can’t wait to get into Maine’s defensive system, where the linebackers are in the middle of just about everything the Black Bears do. And he knows he has a lot of work ahead. Charlton made it clear when he was recruiting Demens that the linebacker position at Maine was stacked. Deshawn Stevens led Maine with 120 tackles, 17 tackles for a loss and nine sacks. Taji Lowe was second in tackles with 85, along with 15 tackles for a loss and three sacks. Jaron Grayer had 42 tackles, seven tackles for a loss and four sacks. As a football player, Demens – whose older brother Kenny played for Michigan and the NFL’s Arizona Cardinals – is more than just a linebacker. As a senior at Detroit Country Day, Demens had 60 tackles – 12 for a loss – along with three interceptions and three fumble recoveries. He also caught 20 passes for 275 yards and four touchdowns. He played some running back for Avon Old Farms last fall. And that was a big reason Charlton likes him so much. Demens had originally committed to UCLA on Oct. 21, 2017. But after a coaching change at UCLA, he de-committed on Dec. 4. That led him to Avon Old Farms – smack in the middle of UMaine’s recruiting area. “In terms of geography, that probably had a lot to do with us getting him,” said Charlton. Michigan, where Demens grew up, is a secondary recruiting region for the Black Bears, who concentrate on the East Coast and New England. Demens said the recruiting process was an eye-opener.